Soil erosion is the natural wearing away of topsoil, caused by rain, flooding, wind and ice. Farming practices may cause erosion of the soil that crops depend on, and many farming practices now encourage techniques that slow erosion. 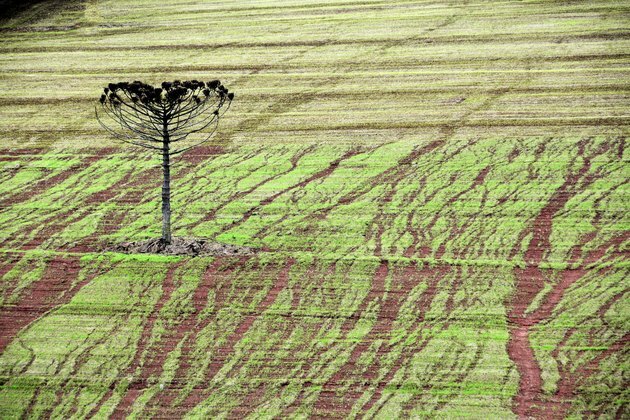 When grasses are plowed for agriculture or forests are cut down for development, the soil is vulnerable to washing or blowing away. Landslides become more likely. Rainwater washes over exposed soil rather than soaking into it, causing flooding. Farming is one major contributor to soil erosion. Heavy rainfall onto tilled land often creates gullies that push soil off the land and into nearby creeks and streams. In areas of undisturbed land, eroded soil is replaced by earthen matter at about the same rate as it erodes. But there are ways to reduce erosion, and researchers are trying to help farmers do just that. Left alone, those gullies will get bigger. Not only will more erosion occur, but the land will be less productive for farmers, so preventing erosion is an economic gain. High winds can also cause soil erosion on farms, especially if there is no vegetation to stop it. High winds can blow away soil from large farm fields, causing the soil to accumulate in some areas and leave other areas barren. Fields with loose soils, slopes and drainage are more susceptible to soil erosion. But there are ways farmers can combat erosion. Some of these techniques have roots in the Dust Bowl of the 1930s, when the U.S. Soil Conservation Service, now the Natural Resources Conservation Service, helped farmers reduce massive soil erosion from wind damage. Other farming methods used to prevent erosion are more ancient. One of these ancient methods is terrace farming – or cutting flat areas out of hilly landscape to grow crops. This is commonly done in the rice fields of Asia and the vineyards and farm fields of the Mediterranean region of Europe. Terrace farming has been used since the Inca civilization dominated the Andes Mountains region in South America. No-till farming is a more recent practice that helps prevent soil erosion. No-till farming is when farmers create a narrow furrow, just large enough to plant a seed. The field is not plowed, which increases the amount of water that seeps into the soil, helps the soil retain organic matter and recycles nutrients. No-till farming is usually done with cover crops, which also adds nutrients to the soil and helps it retain water and prevent erosion. Windbreaks, also called hedgerows, are lines of trees and shrubs planted to prevent wind erosion. Many of these were planted in the Midwest after the Dust Bowl. Soil erosion can also be caused by improper construction methods, which funnel water off a construction site rather than properly divert it. Many localities require contractors to divert water to prevent runoff, but sometimes this is still not done right. If you're removing trees or vegetation from a construction site, a mobile grinder can chip the material, and it can be spread on the site for erosion control. Plastic sheeting can be used for small areas. Silt fencing can be used on slopes but is not recommended for waterways, ditches or other areas with heavy water flow. Straw wattles, which look like long straw logs, are a good method to slow water runoff. When heavy rain, high winds or floods wash soil off the land and into creeks, streams, lakes and rivers, it changes the water quality. It destroys fish spawning beds, reduces usable water in reservoirs, clogs streams and forces municipal water supplies to use costly filtration. The biggest culprit in sediment runoff is phosphorus. Phosphorus is naturally very low in freshwater, but there's lots of phosphorus in topsoil. In water, it can cause algae blooms that can lead to fish kills. Sediment may also carry pesticides, including herbicides and insecticides that can be toxic to aquatic plant and animals. The roots of trees and plants naturally hold soil in place. Riparian buffers are buffers of trees, shrubs and grasses planted next to streams, wetlands, ponds, rivers and lakes to protect the health of the waterways from soil erosion. Riparian buffers occur in nature. If you leave a bare streambank alone and return in a few years, there will likely be a cluster of shrubs, grasses and small trees growing along the bank. That vegetation acts as a filter for soil that may be eroding into the waterway. When there's no vegetation, that filter is gone. A vegetated buffer of grasses, flowering plants and shrubs not only acts as a filter, it also acts as a habitat for insects and wildlife. Forested riparian buffers are especially good because the large tree roots help to filter out the nutrients that are in soil runoff. Phosphorus, nitrogen and other sediments are trapped, reducing the potential for crop and pasture flooding and damage. Ice can lead to erosion if it is muddy. Most erosion caused by ice is in glacial areas. Muddy glaciers contain bits of soil and rock, and this is moved with the glacier. Rocks carried by glaciers actually scrape away the soil. The Ice Age brought glaciers south to parts of the continental United States. The Finger Lakes are a good example of lakes carved by glaciers that eroded soil.